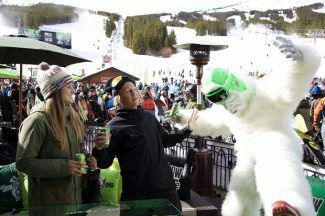 Silverthorne resident Olympic gold-medal winning snowboarder Red Gerard (center) and multi-time X Games medalist Julia Marino hangout with the Mountain Dew Yeti at Saturday's Snow Dance at Breckenridge Ski Resort's Peak 8. BRECKENRIDGE — While Red Gerard and Julia Marino were at dinner on Friday night before they both mingled with fans at the Mountain Dew Snow Dance at Breckenridge Ski Resort on Saturday, the U.S. National Team snowboarders chatted about how they each were glad they decided not to attend a current U.S. snowboard team camp at the Stubai glacier in Austria. The 2017-18 season was an exhausting one for the 18-year-old Silverthorne resident Gerard and the 21-year-old multi-time X Games medalist Marino. In the wake of a season that revolved around qualifying for and performing at the 2018 Pyeongchang Winter Olympics — where Gerard won slopestyle gold, in turn becoming an instant star — both Gerard and Marino are at ease, well, easing into a new competition season. On Saturday morning at the Mountain Dew Snow Dance at Breckenridge’s Peak 8 base, Gerard and Marino spoke of how they each decompressed this summer after all of that Olympic fanfare and pressure. For Marino, that meant adopting her now 7-month-old energetic golden retriever puppy Ziggy — name influenced by the music of Bob Marley — and hanging out at home with family and friends in both Canada and Connecticut. For Gerard, it meant chilling alongside his older brother Malachi and retired professional snowboarder Chas Guldemond down by the beach and skateparks near Oceanside, California. Once the pomp and circumstance of the Olympic gold-medal win and ensuing media tours died down, Gerard found himself riding his bike each morning to Guldemond’s small backyard gym by the California coast. Afterward, Guldemond would take Gerard surfing, typically at Buccaneer Beach — or “Bucky’s” — where Gerard grew from being a still-learning surfer into a more confident carver in the water, confident enough to ride the bigger waves down by the Oceanside Pier. For a guy who makes a living contorting his body above icy snow, Gerard said he does get a little nervous when out there preparing for a wave. While paddling out, the butterflies begin. Over the summer, the Gerard brothers estimated they spent more time on their skateboards and surfboards in California than actually out riding their snowboards in places like Switzerland and New Zealand. But when they both were out there on the snow, it was more about enjoying freeriding. Whether they were setting Malachi’s footage of Red and company’s riding to Willie Nelson’s “Shotgun Willie,” or something as eclectic and foreign as French music, it’s clear the Gerards were focused on having fun through the offseason. In fact, it was brotherly time during the whole Olympic hoopla last February when Red said he had his favorite moment during it all. It came after he won the slopestyle gold and was flying back to Los Angeles for appearances on such shows as Jimmy Kimmel Live. Being able to have some time to chill with Malachi for a few hours in the air meant a lot in terms of reflecting on all they had accomplished. “It was so cool to just sit there and hang out and actually realize what just happened,” Red said. Just weeks out from the start of the new season — Gerard and Marino will compete in slopestyle at the Dew Tour at Breckenridge Ski Resort from Dec. 13-16 — they each said they haven’t put too much thought into how they’ll piece together their slopestyle runs come competition time. They are both very laid-back riders who sometimes don’t even try out or practice new elements of their runs until competition week. The less they can over-think small details of their riding, the better. It’s a trait that they both say can get their coaches anxious at times. Then again, they know their coaches know it’s each of their mellow styles that has helped them win so many medals this early in their careers. “I think they know our motive,” Gerard said.